With the growing popularity of graphic novels, it's no wonder that many people are interested in breaking into the field as artists and/or storytellers. 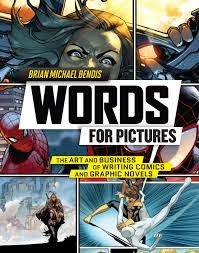 The new book Words for Pictures gives helpful advice from someone who has achieved success as a graphic novel author, but who found there were few places to turn for help when he was starting out. Thankfully, there are now many more resources available for budding graphic novelists -- the author, Brian Michael Bendis, even teaches at the University of Oregon in the undergraduate comics program. Some of the graphic novels he's worked on include the Avengers series and Halo, so he's had a lot of experience in the business. The book begins with general writing advice that crosses all genres. The author quickly points out that most authors don't make much money, and there's a great deal of competition for the public's money and attention. That being said, the next chapter is a very detailed description of how to write a graphic novel -- starting out with such things as writing outlines and scripts before the art ever comes into it, and following up with stylistic additions such as lettering and color. So many aspiring writers and artists have contacted the author with similar questions over the years that one entire chapter consists of FAQs about the business. Also, many creative types are likely so caught up in their stories that they don't consider the legal/financial and other business aspects of their work. The author's wife is his business manager, so there is an interview with her where she spells out the many mistakes he made when starting out. There's also a helpful section on publishing terms. Finally, the book ends with some writing exercises to get the creative juices flowing! The book also includes sections where successful writers, editors, and artists are interviewed or discuss their creative processes. Of course, the book is also lavishly illustrated with both black & white and color images taken from various graphic novels. For the next Frank Miller or Will Eisner, this detailed and inspirational book will be an invaluable resource on every step of the creative process.